At this point it almost feels like I'm repeating myself. 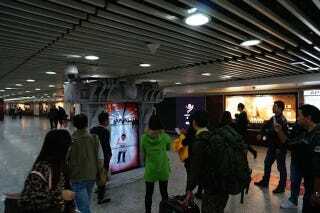 Blizzard and NetEase have pulled out all the stops to get players in China hyped up for the Warlords of Draenor expansion—so much so that they've just installed an actual Dark Portal in one of Shanghai's busiest subway stations! Over the weekend, images of an large box modelled after the Dark Portal appeared online in China. These photos have since been gathered on various Chinese gaming websites such as Sina Games' World of Warcraft section. The "portal" features a camera one side and screen on the other. Passersby walk behind it and pose and their image is displayed in a way that makes them look like they're in another plane of existence. Occasionally, a character from Warcraft is added into the mix. Putting this kind of interactive promotional material in the Subway is a fun and smart idea. The station has 18 different exits that lead up to 6 different shopping centres, two downtown campuses of prestigious universities, a Catholic cathedral and a Carl's Junior (that's right, we've got that in China). It's one of the busiest stations in the city. On top of the "portal", it appears Blizzard and their Chinese partner NetEase have also set up loads of posters along the walls of the station. After making a Warcraft-themed McDonald's and now this, what's next?